Over the years, a number of useful "catch phrases" have been used to help describe to pet owners the importance of taking control of their pet and the environment and creating predictability and clarity in their interactions with their pet. One of the best ways to do this is by control of rewards so that they are used exclusively to reinforce desirable behaviors. For example, food and treats, affection and attention, access to the outdoors, play and walks can be powerful reinforcers as long as the owner only provides these rewards for desirable behaviors. Phrases such as "learn to earn", by William Campbell, "no casual interactions" by Dr. Andrew Luescher ,"deference training" by Dr. Karen Overall, "nothing in life is free" by Dr. Victoria Voith, all capture the concept that when something positive is repeatedly given to the pet immediately following a particular behavior (e.g. sit), he can learn that the behavior is desirable to repeat. In order for the pet to most quickly understand that the reward is for that specific behavior, it is essential that the reward be only given for the behaviors that we want and not for any other behaviors. In addition, by withholding rewards at all other times, it can be insured that the motivational value of the rewards remains high and that undesirable behaviors are not reinforced. "It can be useful to think of the response to the command as a "doggy please" which helps the pet learn how to get what they want and need." Most importantly however, is that you identify each of your pet's rewards so that you can then focus on determining what behaviors earn these rewards. Making rewards predictable and avoiding casual interactions reduces conflict and confusion as your dog gains control over its rewards and what happens to them by exhibiting those behaviors that are desirable for the owners. It can be useful to think of the response to the command as a "doggy please" which helps the pet learn how to get what they want and need. Reinforcing what we want in our pets rather than punishing what we don't want is the focus of an excellent guide to reward based training called "Don't Shoot the Dog", by Karen Pryor. Can learn to earn be used to correct behavior problems? This program is a very useful way to restructure your relationship with your dog. It is important that dogs are taught the social boundaries of their environment and the fact that you are in control of its resources and behavior. Control should be benign and non-confrontational, by controlling what the dog has, what the dog gets and what the dog does. Equally important is that the pet learns what behaviors are desirable and what behaviors earn rewards so that it too gains control over its rewards and consequences. By providing rewards only for those behaviors that are desired, increasingly more accurate responses can be reinforced, and reinforcement of inappropriate behavior (e.g. attention seeking, play biting, jumping up, puling, running out the door) should cease. For example, if your dog enjoys walks, you can teach that a sit at the door earns walks and that walking by your side on a loose leash, will allow the walk to continue, as long as you do not allow your dog to go out the door until it sits, and you do not allow your dog to walk forward unless it keeps a loose leash. Rewards can be affection, attention, praise, food, treats, play, walks, toys, etc. Choose the behaviors that you wish to reinforce and make it clear to your pet what behaviors you expect before the reward is given. The requested behavior must be one the pet knows well and will perform when asked. The request is only given one time. The first step in resolving many behavior problems will be to cease all casual interactions with the pet. In this way, each and every one of the pet's rewards can be given to reinforce the desirable behavior, and to improve response to commands. Always be sure to choose a reward that is sufficiently enjoyable and motivating at that particular point in time. In fact, if your dog is not in the correct mood (such as being extremely aroused or stressed), the incorrect reward will not reinforce the behavior. What rewards can be used for training sessions? Rewards can also be access to things the dog desires such as going outdoors or coming inside. In addition, whenever the dog is in the mood for play, affection or attention, these will be potentially very effective rewards. Rewards must be appropriate and motivating. For example, food treats are often used as training rewards and are clearly less effective if used immediately after a meal. Similarly playing with toys will not be effective if the dog is continuously surrounded with toys. Therefore, if any form of behavior modification or re-training program has to be put in place, it is important that rewards are chosen with care and then withdrawn until the particular task is successfully completed. This will soon make it clear to the dog that not only do you control the resources, but also what behaviors it must perform to get them. However, while timing, consistency and withholding rewards for desirable responses are important, it is not necessary to give anything other than what the dog desires. In other words, there is no reason to "overpay". Give rewards that will get the job done and save favored rewards for new training and for shaping tasks that are more difficult. Alternatively, if the dog has previously been trained to a few commands, you can use a sit or down to teach the dog what behavior you expect before the reward is given. "There is no reason to "overpay"." In other words, whenever you give your dog a meal, toy, play session, or treat, you can turn this into a training session. You can teach your dog to sit or lie down before any of these things are given, as well as throughout its play session. Play also provides an opportunity to teach and reinforce the give command (see our handout on drop and give). You can use a food-filled toy to train the dog to go to a crate or mat, especially if these are the only places that these special toys are given (also see our handout on 'Training Dogs - Settle and Relaxation Training' and 'Behavior Modification – Working for Food – Dogs and Cats'). How can I give food, treats and feeding toys but prevent my dog from getting fat? Determine the calories that your pet needs each day. With sufficient play and exercise, this requirement will be slightly higher than a pet that does not receive sufficient enrichment or does not have to work for its food. 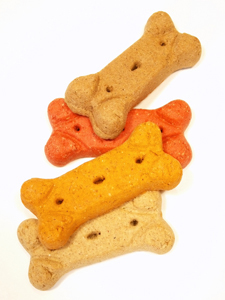 Train your dog through the day using favored treats and food, whenever a new or target behavior is being trained. In addition, remember that there are some rewards that can be used instead of food or treats such as play, a walk or affection if you wait until the pet is in the mood for these. At dinnertime, you can then determine how many more calories your pet requires and give them in a food bowl. If you use food as a training tool, there is no real need for any bowl feeding. Instead, all of your dog's food can be given as rewards, with small "jackpots" each time your pet accomplishes a new goal and the balance of food fed inside feeding toys. How can affection and attention be used as a reward? Affection can be an effective reward and an excellent alternative to food rewards, as long as it is saved for training so that the pet can learn what behaviors earn affection. Another advantage of affection and attention is that you can determine exactly when your pet wants them and they take no calories! "However, attention will not be an effective reward if it is given casually (for no particular behaviors) or if it is given for attention seeking behaviors." However, attention will not be an effective reward if it is given casually (for no particular behaviors) or if it is given for attention seeking behaviors. In fact, giving attention or affection to a dog that is not "in the mood" may actually be a negative interaction that in some dogs can lead to retreat or aggression. Having your dog sit or lie down whenever it seeks attention or play is an excellent opportunity to train these behaviors. At the same time, the pet begins to learn that the affection and play are rewards that are under your control, and require appropriate behaviors to be able to earn them. Pets that receive predictable rewards are less confused and anxious since they themselves learn the proper way to get these resources. However, affection is not as effective as food or toys in motivating new behaviors. Instead, you should use novel toys and favored food treats to train new behaviors, and for lure and target training. What happens if my dog refuses to obey my commands? Avoid confrontation or any situation that might lead to aggression if you are unable to maintain control. Terminate the exercise. Remember that every time your dog fails to comply it reinforces his control, not yours. In other words, if you ask the dog to sit prior to opening the door, but the dog does not comply, you must walk away without opening the door. "... every time your dog fails to comply it reinforces his control, not yours." To improve initial learning and increase the chances of success, another option is to bring along toys or food so that you might achieve the desired behavior the first few times with target or lure / reward training (see our handouts on 'Behavior Modification – Reinforcement and Rewards' and 'Training Dogs - Settle and Relaxation Training'). Remember that favored rewards and lures should be used only the first few times, as a means to more quickly communicate the behavior that is desired. To teach learn to earn, remember that you need to avoid casual interactions since this could inadvertently reinforce undesirable behavior. At the very least, random interactions in a variety of circumstances will devalue the rewards and take away any chance that these interactions could be used for reinforcement (since the pet is unable to learn what behaviors earn these rewards). This is true for affection, play, feeding or randomly given treats. Every time you give your dog something that it wants or something that it likes, without first getting a behavior that you want your pet to learn, you lose a valuable opportunity for training and control.